Newly unveiled research conducted on more than 670 guests and 200 hoteliers demonstrates how evolving online behaviors are placing greater demands on hotel Wi-Fi networks. 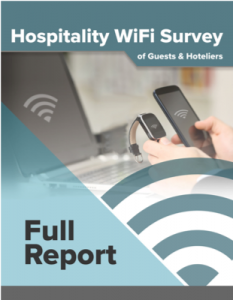 Clearwater, Fla. — April 3, 2019 —Hotel Internet Services(HIS), a full-service provider of internet services and solutions for the hospitality industry, has published a survey conducted on more than 670 guests and 200 hoteliers in order to demonstrate how advances in technology and increasing guest expectations have placed a higher strain on hotel Wi-Fi networks than ever before. Following a similar study published in 2015, the full report provides a detailed analysis of how the presence of high-powered smart devices have skyrocketed in the last four years, with guest online activity keeping pace to become ever more diverse and in need of additional network resources. Significant findings from the survey include the fact that more than 90 percent of hoteliers frequently encounter guests seeking to connect more than one device, demonstrating an impressive 30 percent increase since 2015’s survey results. Of further note is the growing diversity of device types. Smart watches, for example, have risen in guest adoption numbers by more than 16 percent. Such numbers standing alone should provide reason to reassess an existing network’s capabilities to cater to increased connectivity. Yet just as significant is the rise in demand for bandwidth-consuming services such as content streaming and casting, with guests seeking the ability to cast from personal devices onto guestroom televisions growing to a new height of 65 percent since 2015. With many existing hotel Wi-Fi services originally designed to cater to one device per room and to only provide sufficient bandwidth for basic internet browsing needs, the HIS survey additionally provides valuable insight into why it is now so critical for hoteliers to update their networks. For example, more than 90 percent of guest respondents indicated that the ability to access a hotel’s Wi-Fi is ‘very important,’ while another 58 percent disclosed Wi-Fi service quality as being ‘highly likely’ to impact their booking decisions. Other noteworthy survey findings demonstrate that while the vast majority of hotelier respondents recognize the importance of Wi-Fi service quality, more than 80 percent of guest respondents revealed that they continue to encounter an unsatisfactory experience. Survey feedback also indicates that guests are increasingly concerned over the issue of data security, with more than 90 percent of respondents indicating such a concern. This stands in contrast to the more than 60 percent of hoteliers who felt that security improvements could still be made to their existing networks. To download a copy of the HIS survey on guest Wi-Fi trends and expectations, please click here. HIS has deployed numerous small to large-scale facility-wide wired, wireless, and in-room entertainment solutions across the U.S. They currently maintain hundreds of properties with over 150,000 guest rooms. Based in Clearwater, Florida, HIS maintains two offices in the U.S. For more information, please visit www.hotelwifi.com.